The season of the cherry blossoms this year has come! 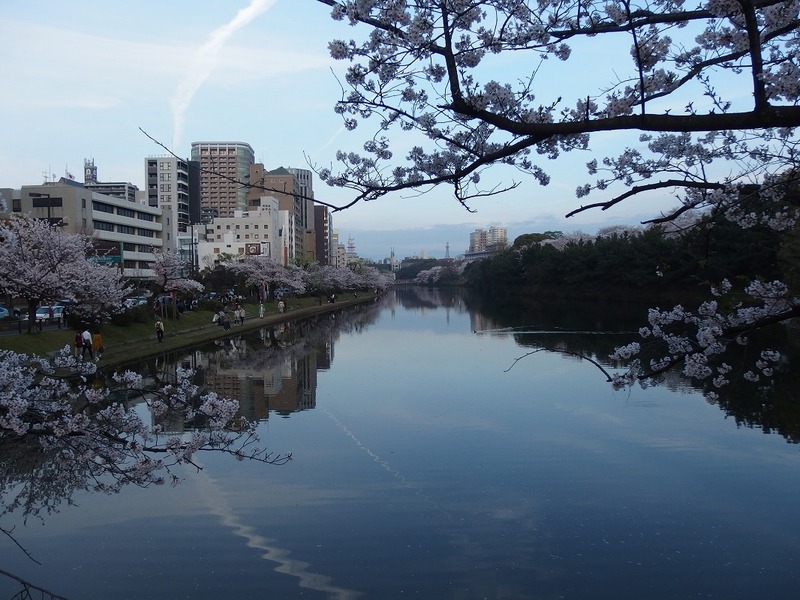 It is Japanese culture to go out to see the cherry blossoms in the spring, and I love it too. 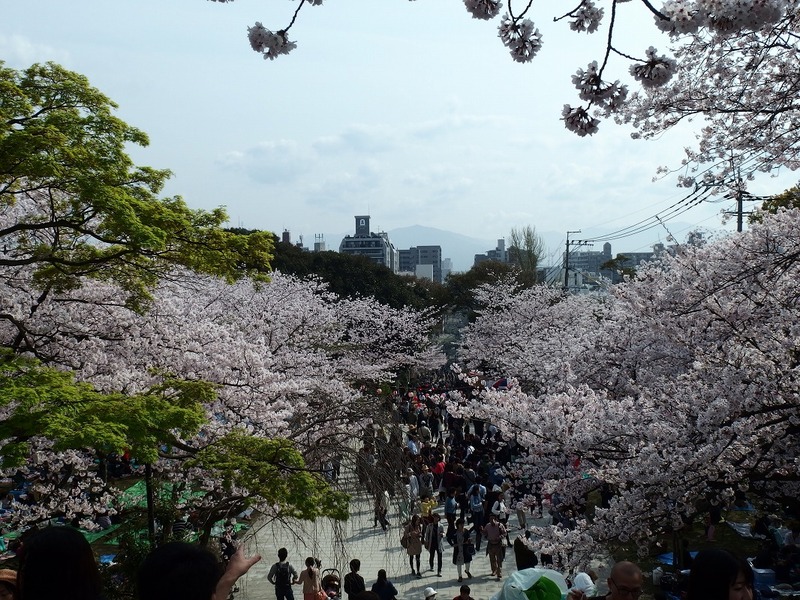 I’m going to introduce you some of the best spots of the cherry blossoms viewing in Fukuoka City. 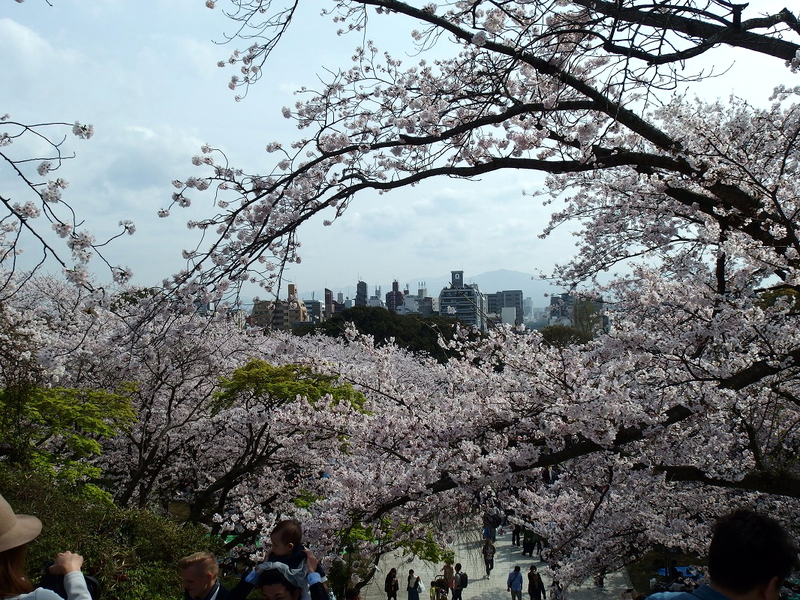 This time, I visited three parks in the center of the city to see beautiful Sakura (cherry blossoms). 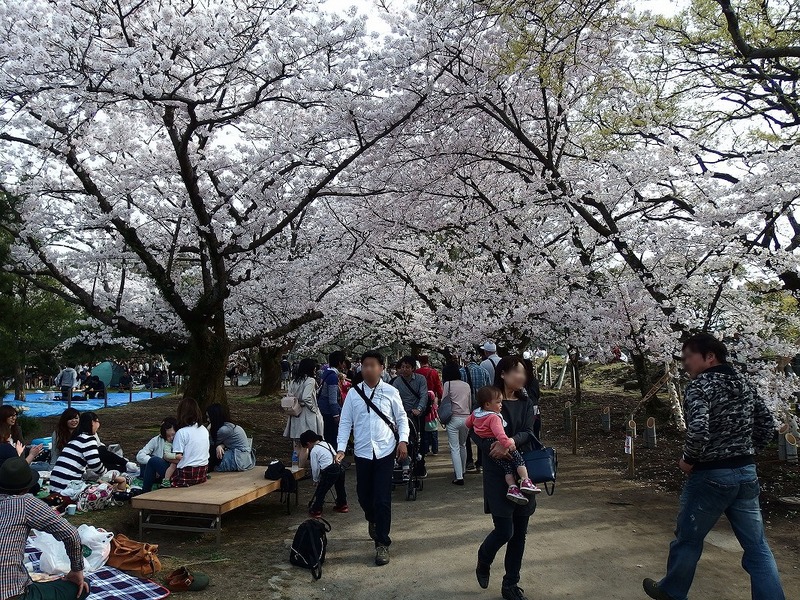 First, visited Nishi Park (Nishi Koen) which has been chosen as 100 selections of Sakura in Japan, and Ohori Park the oasis of locals, and lastly, Maizuru Park which I previously visited for Sakura. First, Nishi Park. The park is located in Chuo ward, Fukuoka (福岡市中央区), in a hilly area, which was called Aratsu Mountain (荒津山) in old time. It is maintained as a park in 1881. Local people enjoy the 1300 of cherry trees in spring and colored leaves of maple and ginkgo in autumn. Arrived at Arato Ichome bus stop (荒戸一丁目). We can easily access to those three parks from this bus stop. The slope to the Nishi Park. 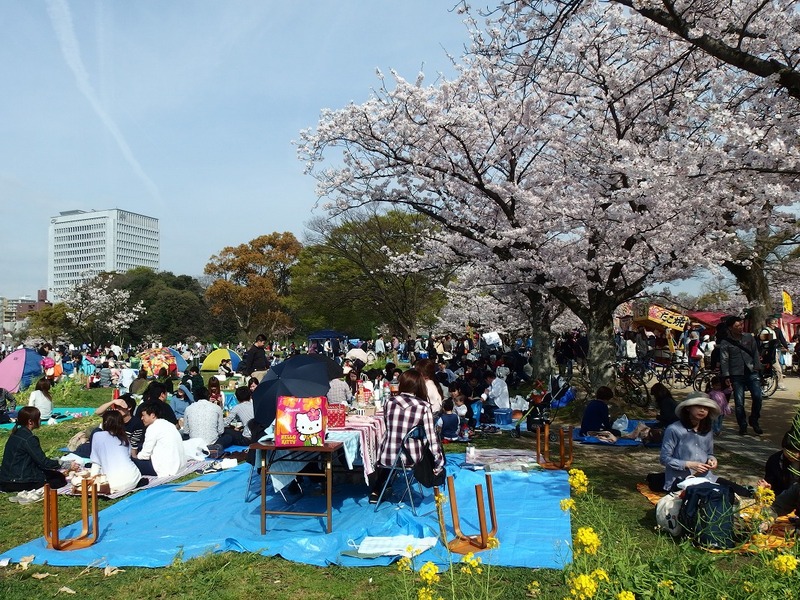 It was already crowded with many people. On both sides of the road were lined with beautiful cherry trees. 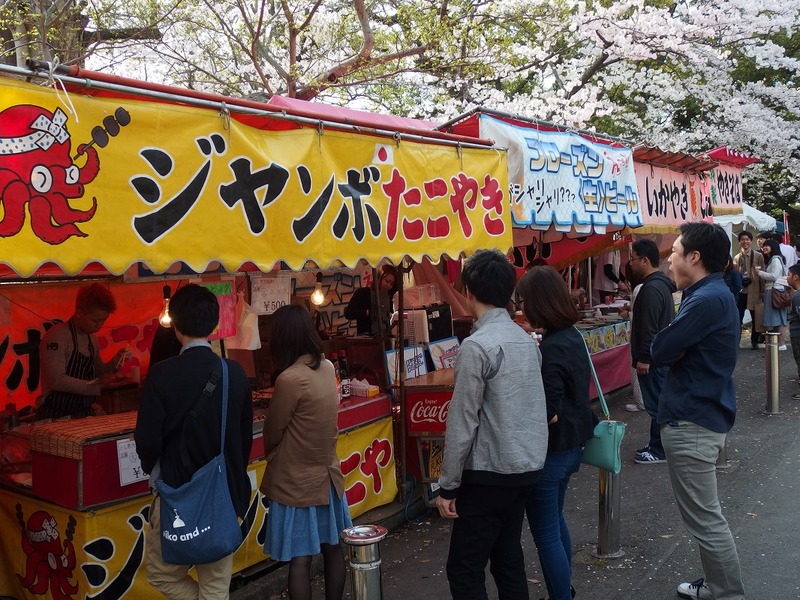 There were some food stalls and people were making a line for it. 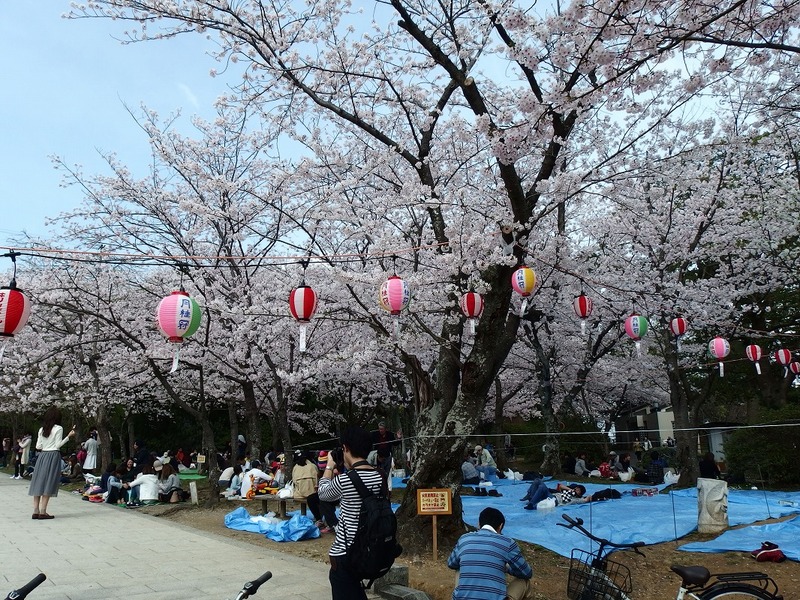 In Japan, it is a sight to be seen often in the season of cherry blossom viewing or festivals. Arrived at the park. Sakura here was indeed beautiful. This is what we call that “cherry-blossom viewing” of Japan, “Hanami (花見)” in Japanese. 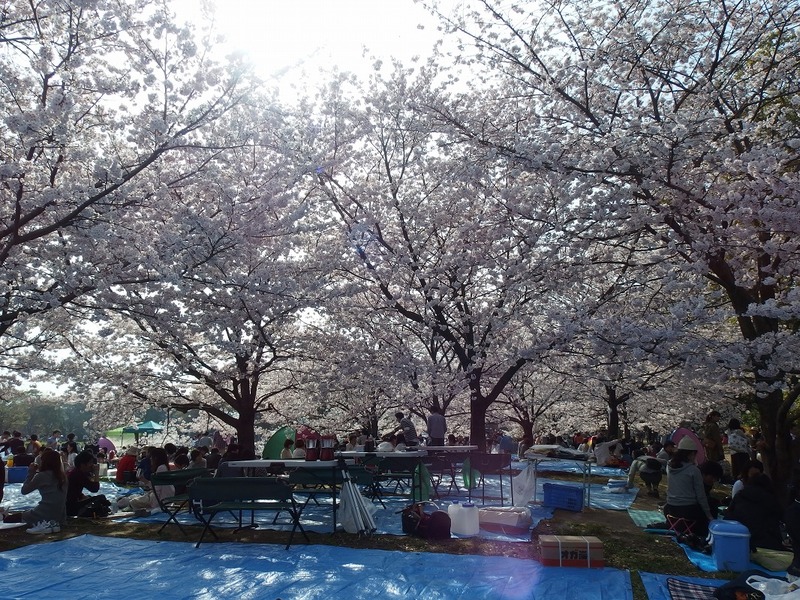 Place a sheet under the cherry trees, and while enjoying Sakura, eat and drink with family and friends. There was a shrine on the stairs. 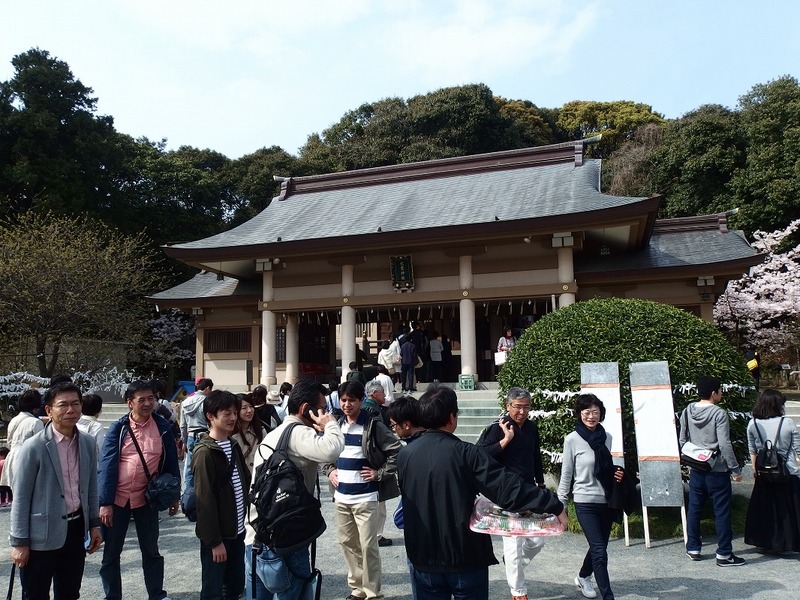 This is Terumo Shrine, which is enshrined the famous Fukuoka feudal lord, Josui Kuroda (黒田如水). I was able to view the Fukuoka City from here. 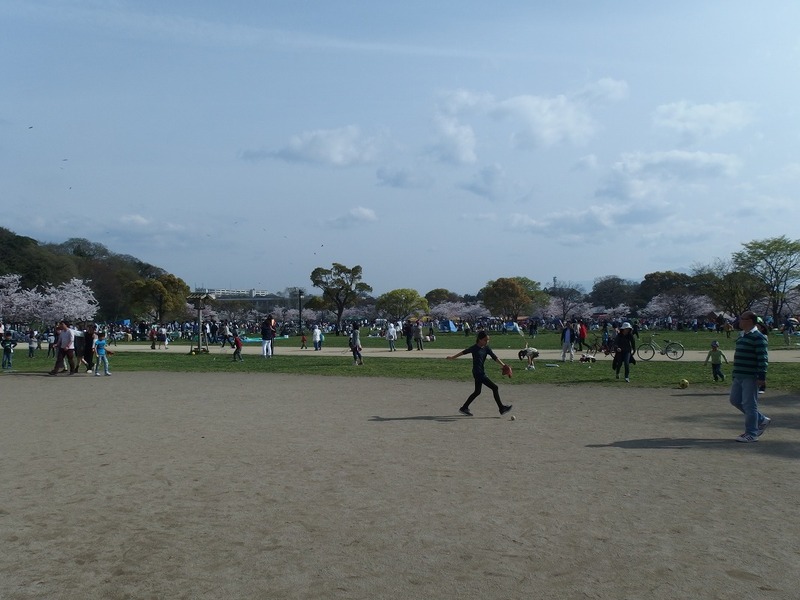 Next is Ohori Park (大濠公園). It took only 7 or 8 min from Nishi Park. 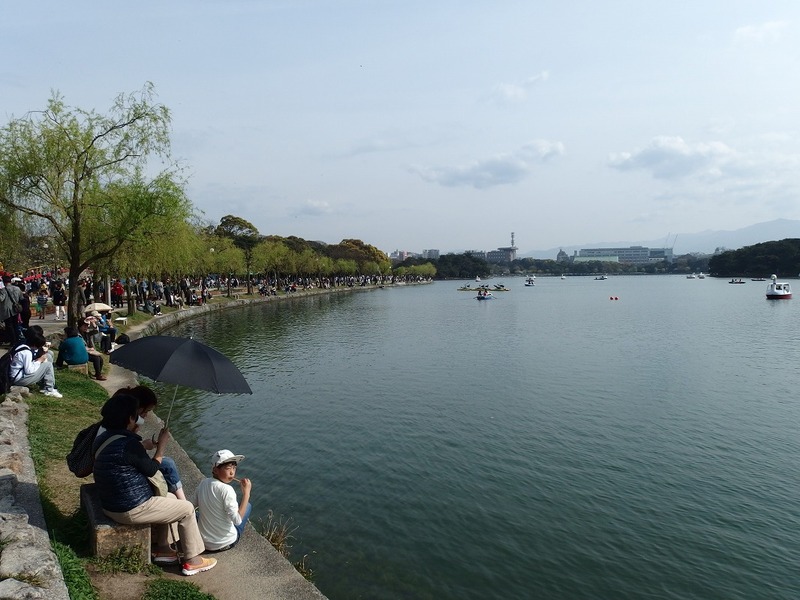 Ohori Park is located in the center of Fukuoka City, total area of the park is about 398,000 square meters, which includes a pond of about 226,000 square meters in the park. 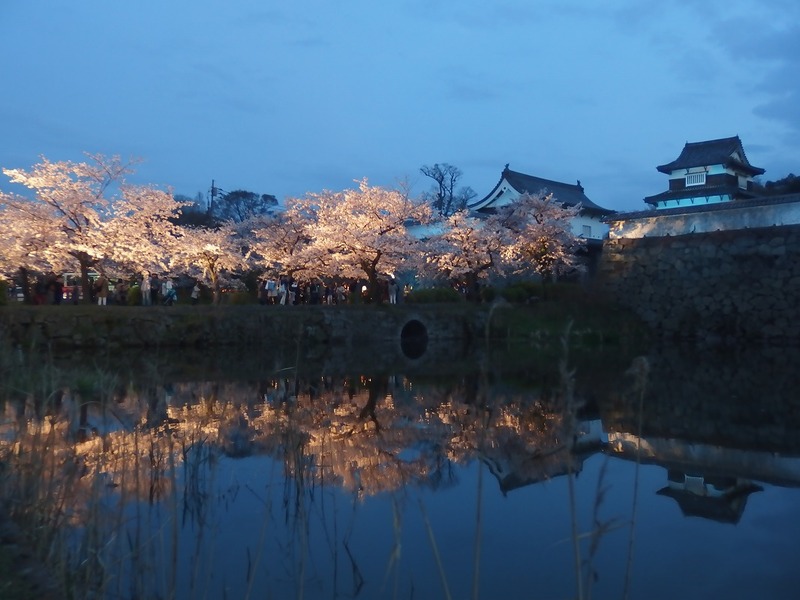 Because there are a Noh theater, a Japanese garden, a boathouse, a cafe within the park and is easy to access the West Park or the Maizuru Park. 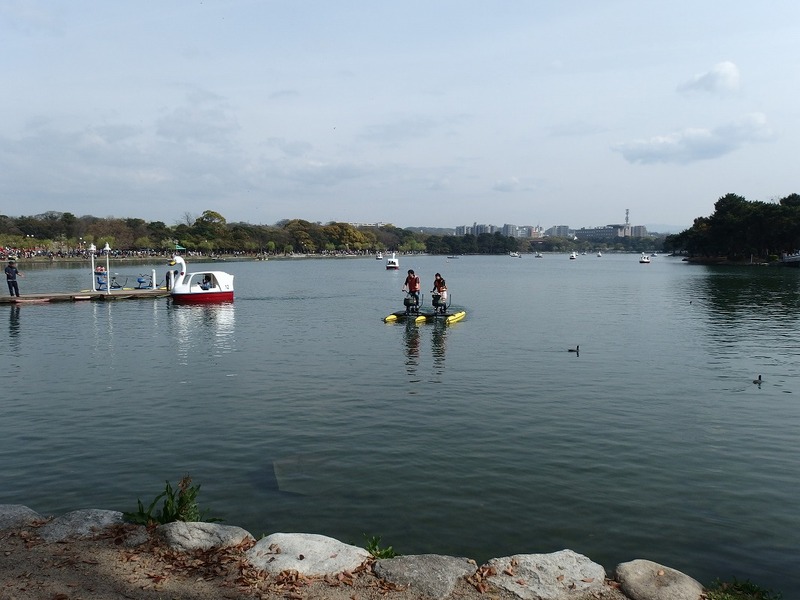 Ohori Park is the place of recreation and relaxation for Fukuoka citizen. 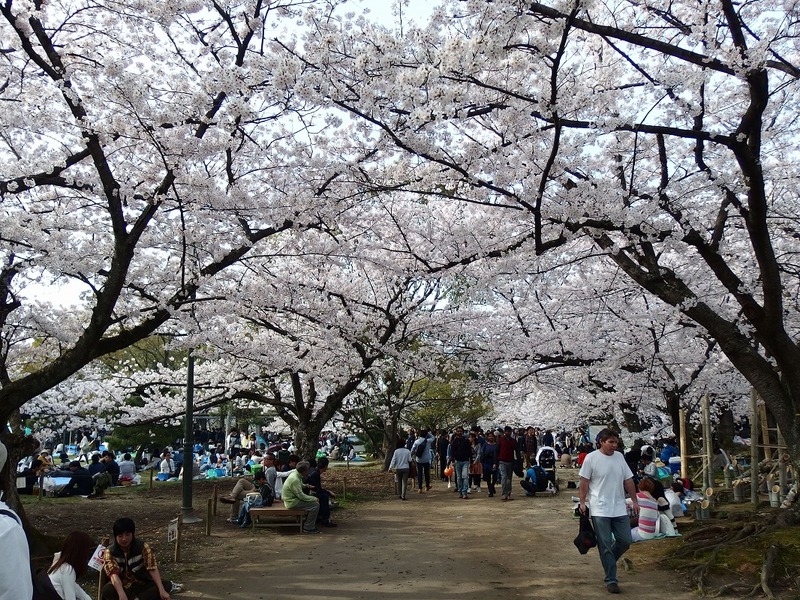 Ohori Park itself, there is no place to enjoy the cherry blossom viewing. So I passed through the Ohori Park to the left and moved to Maizuru Park. Ohori Park just adjoins the west square of Maizuru Park. This place is the west square of Maizuru Park. Cherry trees were in bloom so as to surround this open space. 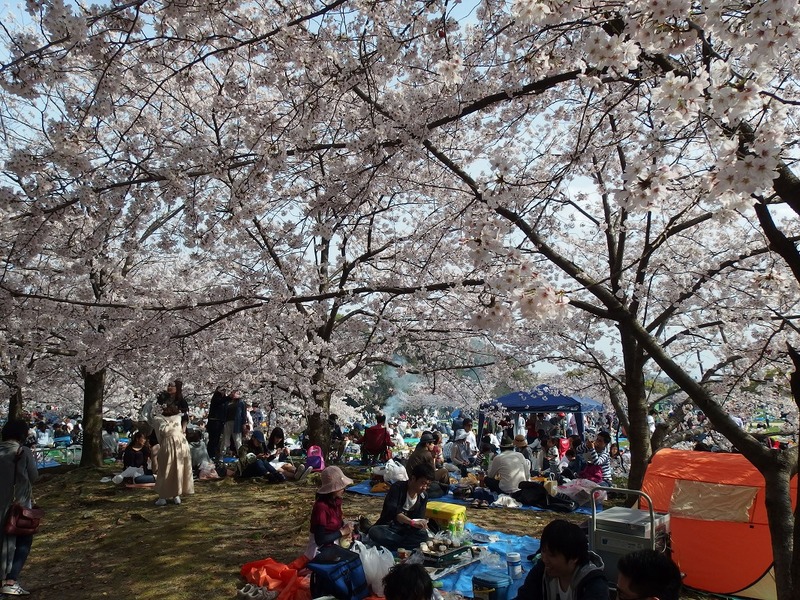 People along the cherry trees were relaxing under the trees. 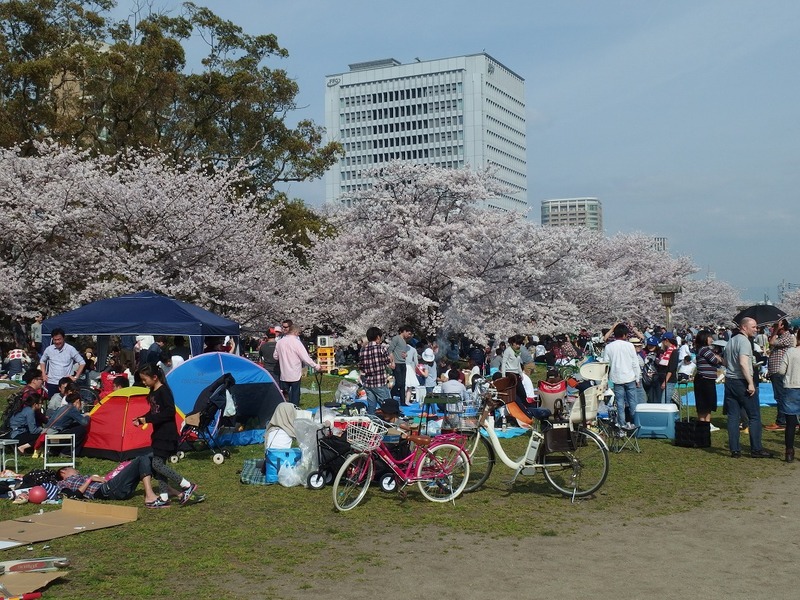 I’m happy to see many people from abroad also enjoying the cherry blossom viewing in Japan. Those trees are not very high and the flowers bloom within the reach. So we can enjoy the cherry blossoms really close. Now moved to the Maizuru Park that I introduced before. 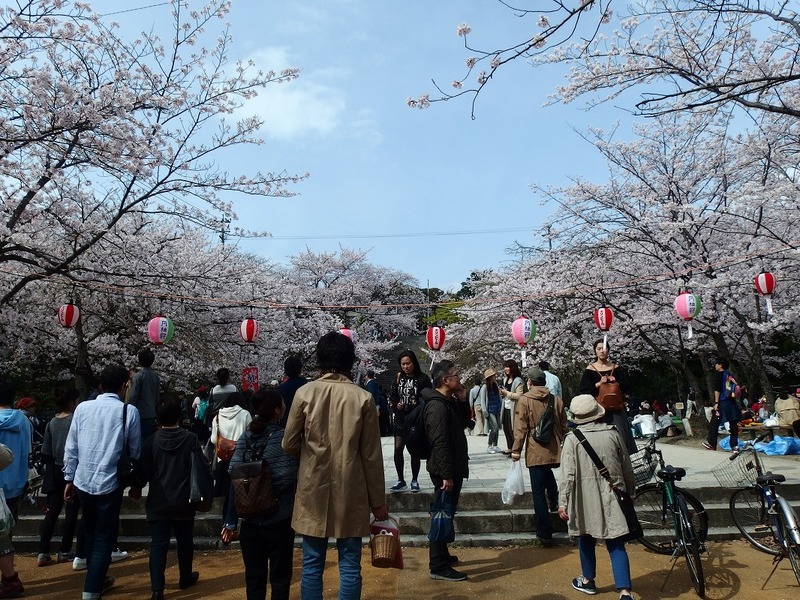 Cherry blossoms at Maizuru Park in Fukuoka Japan 2014. 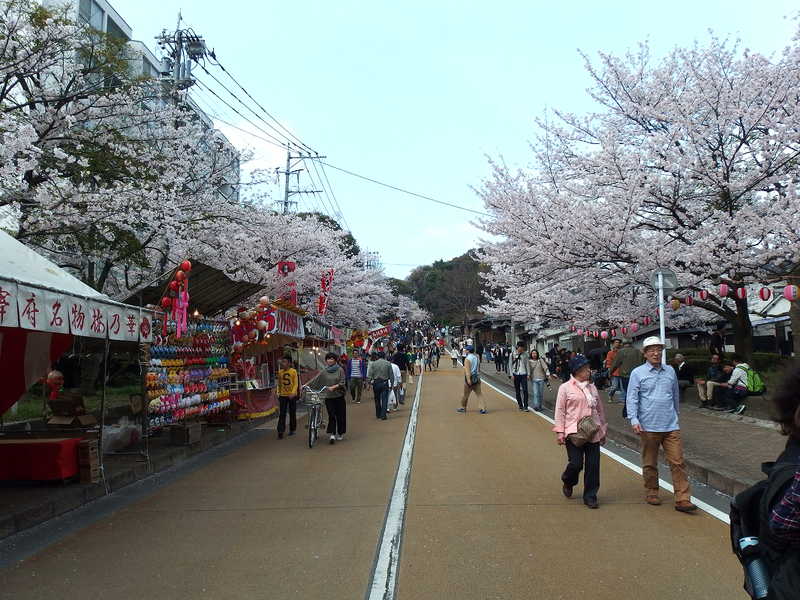 It is about 2 to 3 minutes to walk from the west square of Maizuru Park. The photograph below was taken near the castle tower of Fukuoka Castle Ruins. Unfortunately this year of weeping cherry tree has already fallen before the Cherry Blossom festival. 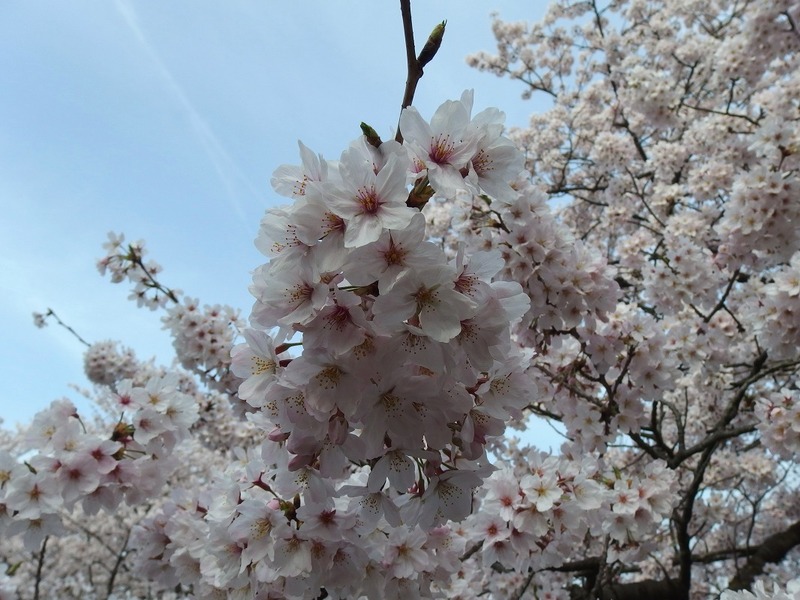 Since the weeping cherry tree begins to bloom from the end of March, full bloom of the weeping cherry is usually a little earlier than the Yoshino cherry tree. 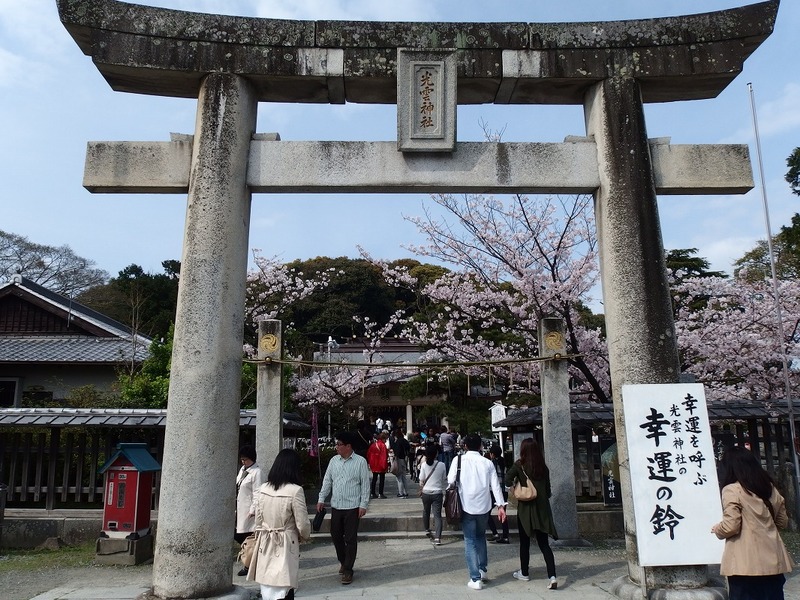 Now, head to the place which is one of the best spots for the photography of Maizuru Park. 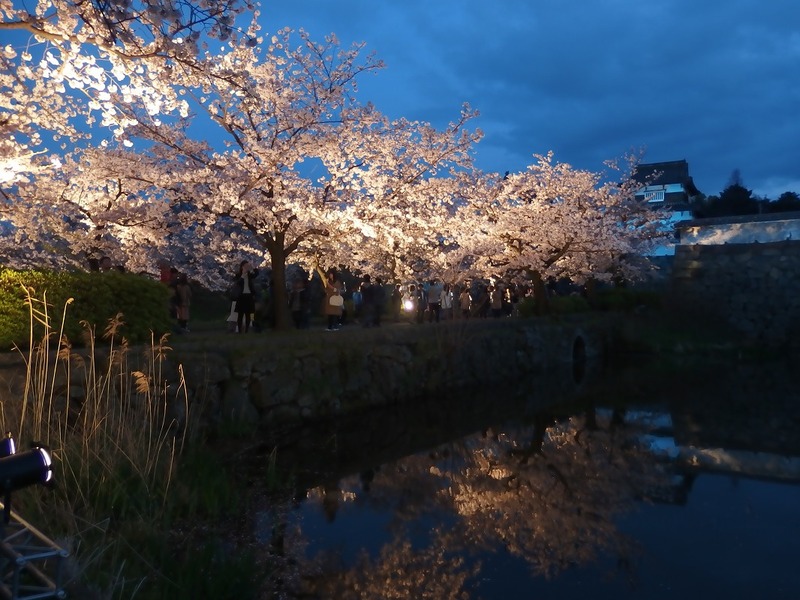 A lot of people were already waiting for cherry trees to be lighted up. 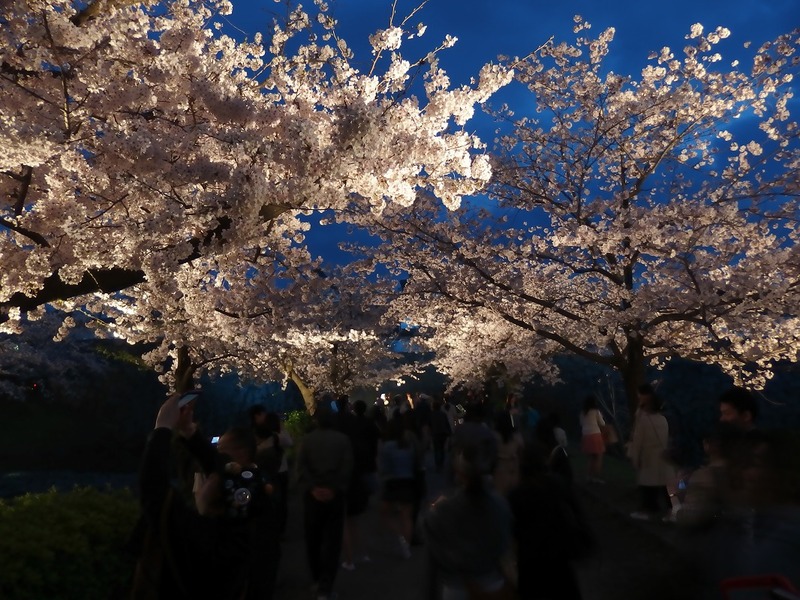 Cherry Blossom Festival is carried out every year at the Maizuru Park, and at some areas of cherry trees are lighted up during the time of 18:00 to 22:00. Some of those lighted up areas charge admission fee 300 yen for each places. It has finally getting dark. Photo is around 7 pm. The cherry tree reflected in the moat was beautiful. 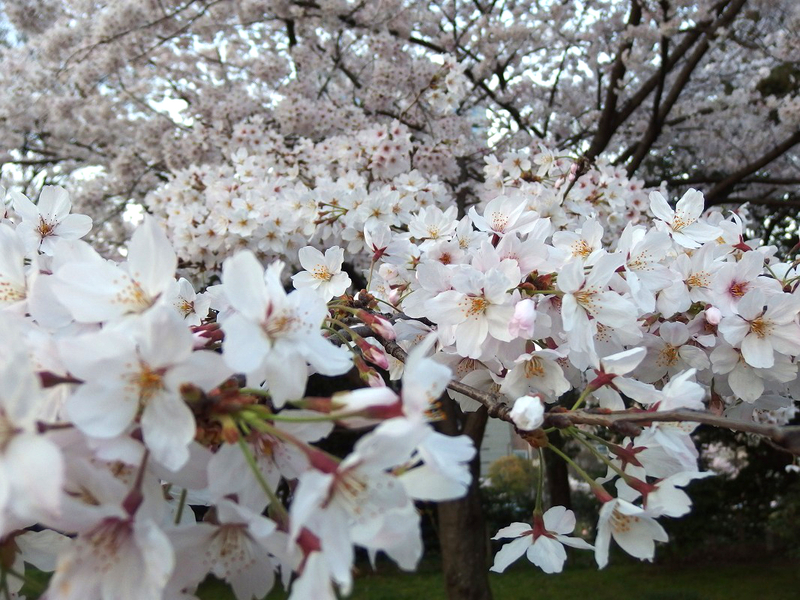 Seeing Sakura from a distance is beautiful, but close view of the tree is also amazing. This time, I introduced Nishi Park, Ohori Park, and Maizuru Park. 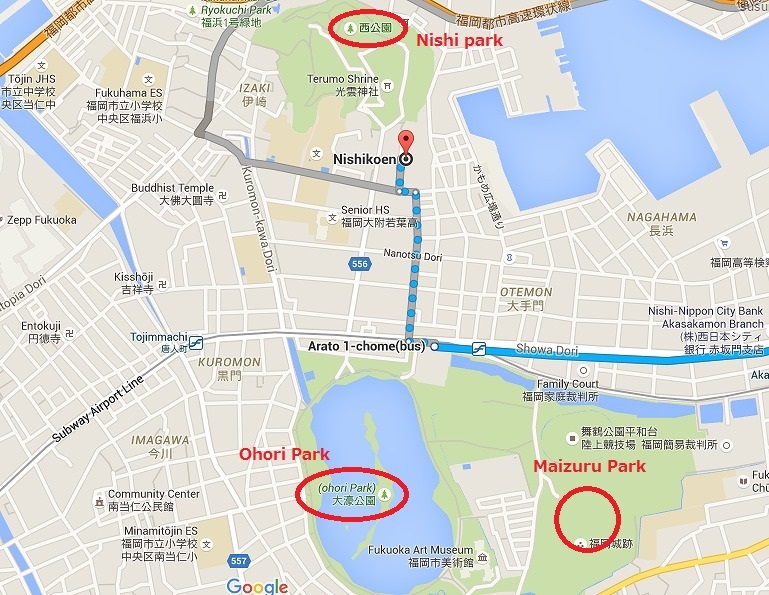 Those 3 parks in Fukuoka city are in range of the walk each other. Please try to visit them in the season of cherry blossoms. Unfortunately, I found some branches of the trees that have been folded by hand during this time of visit. 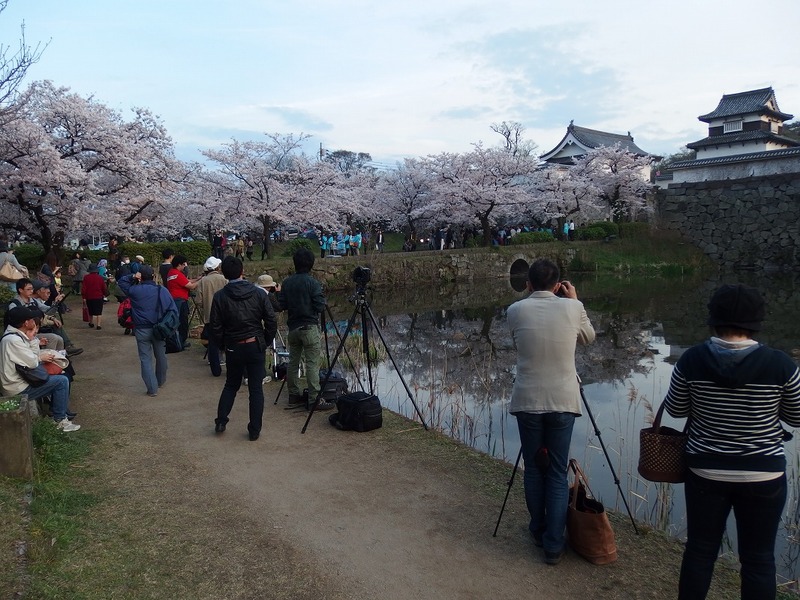 Let’s enjoy the cherry-blossom viewing together without breaking a branch or scattering petals for the photos. Nishi Park: Bus: Take a Nishitetsu bus (西鉄バス) and get off at Arato Ichome (荒戸一丁目) bus stop (There are some other bus stops nearby). Then walk 7 min. Subway: Take a Subway airport line (Chikatetsu-Kukosen; 地下鉄空港線) and get off at Ohori park station (大濠公園駅). Then walk 7 min. 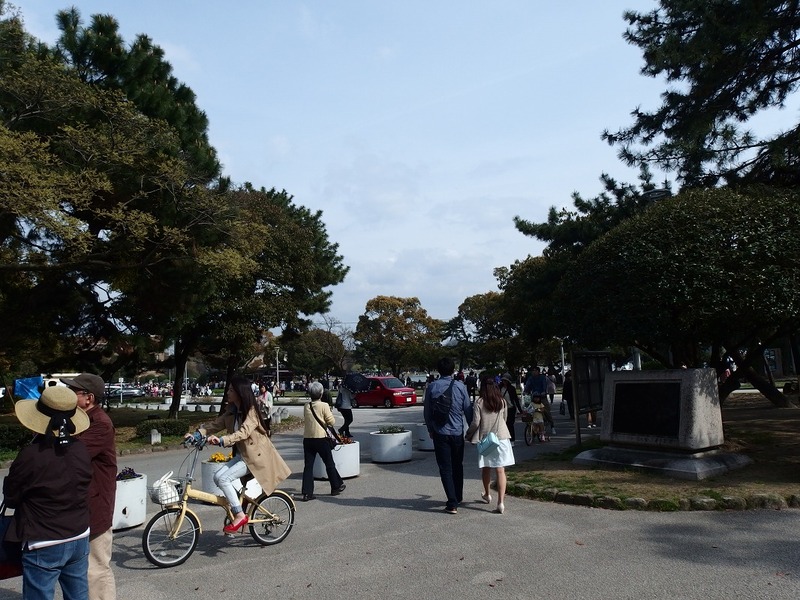 Ohori Park: Bus: Same as Nishi Park (Also some other bus stops nearby). Then walk 3 min. Subway: Same as Nishi Park. 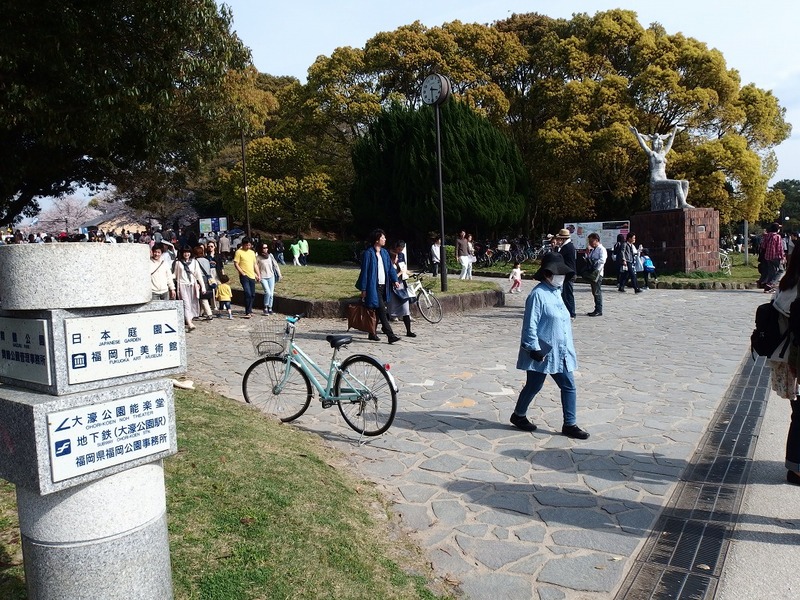 Maizuru Park: Bus: Get off at Otemon (大手門) bus stop or Heiwadai-Korokanmae (平和台鴻臚館前) bus stop and walk 5 to 8 min. Subway: Same as Nishi Park. ← It’s always super deals! Excellent 100 yen shop in Japan: Visited DAISO at Hakata bus terminal.